The Existing Cable is Too Short, What to Do? Here’s a solution to a common problem when replacing old equipment or appliances with new ones. In this case, when replacing a kitchen range hood fan assembly, the old cable was too short to reach the junction box in the new fan. Recently my mom’s kitchen exhaust fan died. So I shut off the electric and disconnected the fan. I bought a new exhaust fan but the old connection wires are on the opposite side and are not long enough. Is there anything I can do to make the wires long enough to reach? Whenever a cable is not long enough to reach the new location with enough length to make a proper termination and splice, you only have 2 choices. Replace the entire cable from its origin to the new destination, or you can splice the cable and add the required length by using an approved junction box and cover plate. The junction box location must be accessible after the project is complete. 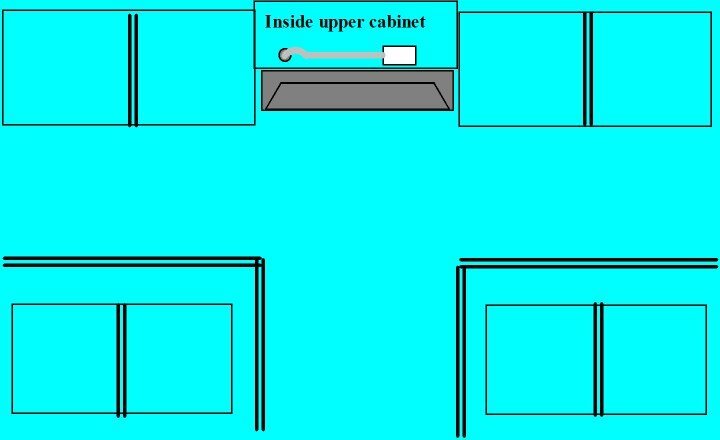 Without knowing the exact details of this particular situation, I would suggest that you could mount a junction box either in the wall above the range and hood location, or a more likely location would in the cupboard above the range. 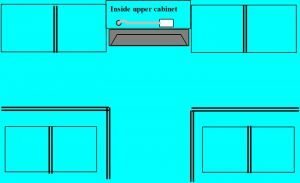 I’ll assume that there is cupboard in this case, so I’ll show you how I would remedy this situation. First, I would shut off the power to this circuit (as you have already done I hope)! Follow all proper safety procedures when working with electricity. 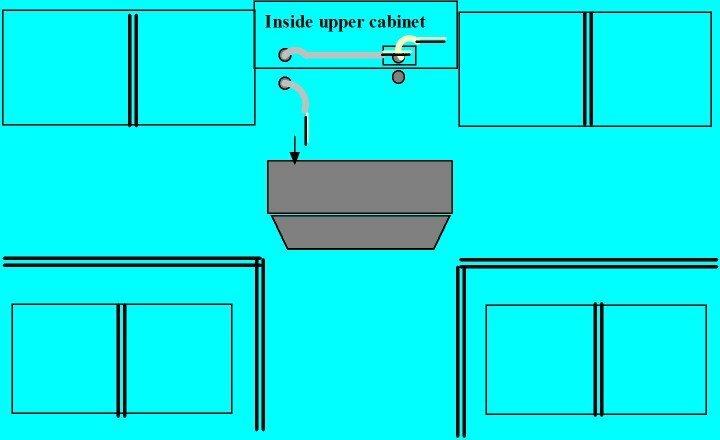 Illustration showing new range hood ready to install, but existing cable too short. 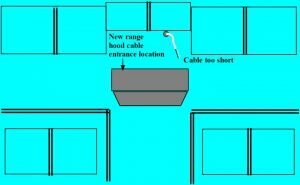 I would attempt to fish the existing cable up into the wall behind the cupboard above the range, and mount either a surface mount junction box, with the existing cable entering through the back of the box, or a flush mount ‘old work’ box mounted in the back of the cupboard, whatever scenario is more feasible. If you can get the box flush mounted, then you can use NMD cable (romex or loomex) for your extension, and fish in the new cable back over and down behind the wall in the correct location to enter the range hood. You will likely have to drill through a wall stud to achieve this. If you bring the existing cable in to a surface mount box in the cupboard, then you would have to use armoured flexible cable (BX cable) to go from the junction box through the interior of the cupboard and enter the range hood at the knock-out location available, likely having to drill out of the back of the cupboard into the wall space, and then fish the cable back out to enter the back of the range hood termination compartment. Cable fished to junction box, new BX cable from junction box to new location. Ready to install range hood. When the cables and junction box are installed and in place, make your splices (ground to ground, white to white, and black to black) using approved wire connectors. Cover your junction box with the appropriate blank cover plate. 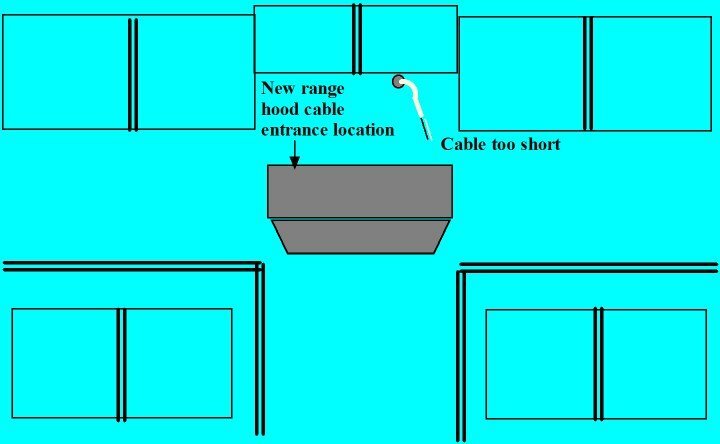 Bring your new cable into the back of the range hood and enter the range hood using the correct cable connector. Make your final connections, and once you have everything in place (and the ventilation ducting connected if applicable), turn on the power and check your work! Range hood installed, cables in place, splices made, ready to test. The important thing to remember is that you can’t just make a splice in a cable and extend the wires if you don’t have enough length to reach the new destination. You must go through the proper steps and follow code rules when faced with a situation such as this. 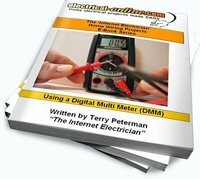 How Can I Add a 4-way Switch to an Existing 3-way Switch Network? Proper Technique for Stripping Wire or Cable – Never Nick the Wire! How Do I Wire a Receptacle From a Light Outlet, But Keep it Hot When Light is Off. 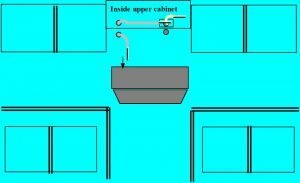 This entry was posted in Home Electrical How-To, Q & A and tagged BX cable, cable, connectors, junction box, kitchen fan, Loomex, range hood, Romex, splice, wire. Bookmark the permalink.